Raoul Island volcano is the northernmost, largest and best known of the Kermandec islands NE of New Zealand. The anvil shaped 10 x 6 km wide island is the top of a large stratovolcano breaching the sea surface. At its submarine base, the volcano measures 35 x 20 km. The volcano has 2 overlapping caldera containing 3 lakes (Blue, Green, and Tui). Historical eruptions have been observed since the 19th century. During the past several thousand years volcanism has been dominated by dacitic explosive eruptions. 2 Holocene calderas are found at Raoul. The older caldera cuts the center of Raoul Island and is about 2.5 x 3.5 km wide. Denham caldera, formed during a major dacitic explosive eruption about 2200 years ago, truncated the western side of the island and is 6.5 x 4 km wide. Its long axis is parallel to the tectonic fabric of the Havre Trough that lies west of the volcanic arc. Historical eruptions at Raoul during the 19th and 20th centuries have sometimes occurred simultaneously from both calderas, and have consisted of small-to-moderate phreatic eruptions, some of which formed ephemeral islands in Denham caldera.  A 240-m-high unnamed submarine cone, one of several located along a fissure on the lower NNE flank of Raoul volcano, has also erupted during historical time, and satellitic vents at Raoul are concentrated along two parallel NNE-trending lineaments.